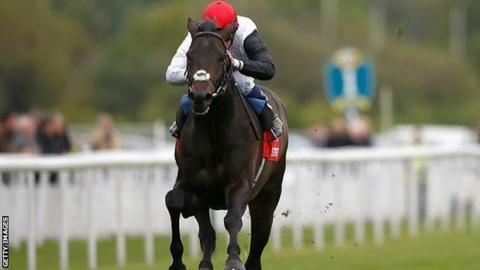 Trainer John Gosden had a 1-2 in the Dante Stakes at York as Golden Horn beat stablemate Jack Hobbs, with Elm Park third. The 4-1 victor, under William Buick, claimed a two-and-three-quarter-length win from his better-fancied stablemate in what is a top Epsom Derby trial. Golden Horn is not currently entered for the Classic on 6 June, but could be supplemented for a £75,000 fee. John F Kennedy, trained by Aidan O'Brien, finished last of seven. Gosden said it would be down to owner Anthony Oppenheimer whether the horse runs in the mile-and-a-half Epsom race. "He's been very firm with me that he's a mile-and-a-quarter horse and he told me that all along, so we will see," said the Newmarket trainer. Golden Horn was quoted by bookmakers as 6-4 favourite for the Derby, with a run, with other leading contenders including Zawraq (5-1), trained by Dermot Weld. All the post-race chat centred on whether owner Anthony Oppenheimer would cough up the £75,000 late entry fee for Epsom. Stamina is his concern, but the colt kept on takingly at the end of this mile-and-a-quarter, and I suspect Oppenheimer will pay. Gosden's runner-up will probably go too, though has a Royal Ascot alternative. Elm Park ran nicely in third, having been found wanting for full-fitness late on, while heavily-defeated Irish pair Ol' Man River and John F Kennedy seem to be out of the picture now.